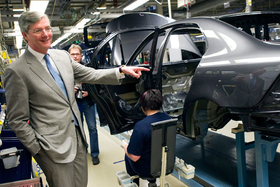 Spyker CEO Victor Muller visits Saab's factory in Trollhattan on March 22. AMSTERDAM (Reuters) -- The CEO and largest shareholder of Dutch carmaker Spyker Cars has reduced his voting interest to avoid making a buyout offer for the rest of the shares, the company said. Victor Muller transferred just under 1.3 million shares to a Cyprus-registered special purpose company, reducing his voting rights in Spyker to 26.8 percent, Spyker said. He had been at 34.3 percent previously, following a complex transaction to buy Swedish automaker Saab from General Motors Co.
Spyker said the transfer was for the express purpose of taking Muller's stake below the 30 percent threshold at which he would be obliged to make a buyout offer for the rest of the loss-making company. In a statement Wednesday, Spyker said the special vehicle had independent ownership and management but that Muller could buy his shares back at any time for the same price the entity paid. "Any increase in the value of the shares will be for the benefit of Mr. Muller if the option is exercised," Spyker said. However, it did not say who owned or managed the special vehicle, called Dorwing Solution Ltd.